Saturday morning cartoons were over, and Ellen had taken Wire outside where they sat under the tree. Ellen was reading a comic book featuring Wire’s favorite superhero, Miss Moonbeam. Of course, Wire was captivated by the story. Ellen’s voice sounded just like Miss Moonbeam on television. When she suddenly paused in the exciting narrative, Wire’s ears stuck straight up wondering what was happening, and anxiously waiting for her to continue. Wire rolled over instantly, facing the direction of the street, and his tail started wagging. Sure enough, coming down the street was Abigail, the bookworm, and she was wearing her magic backpack that always contained great books. Ellen was already up and running to meet her friend, and Wire was right on her heels in an instant, barking, and jumping, his tail wagging in excitement. It was always a day of fun when Abigail came to visit. But what will she read to us today? Wire wondered. Abigail patted Wire on the head when they reached her, then Ellen invited her into the house. At first Wire was afraid he would be left outside, but he jumped for joy when they held the door open for him. Ellen and Abigail sat on the floor under the window, where the sunlight was brightest. Wire plopped down in front, as Abigail adjusted her glasses, then reached inside the backpack. Pulling out two books, Wire noticed instantly that one was a comic book, the other a shiny blue hardback. Holding the comic book up, the front toward Wire, he saw a dog on the cover. Unfortunately, he couldn’t read, but he knew the book was about a dog. “This is the Comics Illustrated #91, and the story is “The Call of The Wild” by Jack London,” Abigail began. “It’s the story of Buck, a family pet stolen and sold to people buying sled dogs for Alaska. The comic book was published in 1952. “Jack London wrote the story for the pulp magazines after spending time in Alaska, but it was so good the more important magazines bought it. Saturday Evening Post published the story originally in 1903 in a four-part serial, before it was released as a novel. The story actually takes place in the 1890s, during the Klondike Gold Rush. Wire already loved it. After all, it was about a dog, and he was anxious to hear all about Buck’s adventure in Alaska. Where is that? He thought. Abigail must have heard him, for she then said: “Alaska is above California and near Russia and the Canadian Yukon, and it’s very cold. As Ellen stretched out beside Wire Dog and opened the comic book, he was immediately pulled into the story when Abigail began. Wire learned that Buck had been a pet, owned by Judge Miller in Santa Clara Valley in California. He was a large dog, a St. Bernard – Scotch Collie. Wire could tell from the picture on the comic book what he looked like. But the judge’s servant stole him one night and sold him to some evil men, where he was beaten and starved until he became submissive. In Alaska Buck became a sled dog, which at first Wire thought would be fun, but then he heard how hard it was on dogs in the snow and ice. In fact, Buck had to learn to survive. And there was a real mean dog, too, and this part scared Wire. The mean dog hurt all the others, until Buck got really mad one day and beat him up, then the other dogs hurt the mean one real bad. Ellen and Abigail both giggled, but Wire couldn’t see any reason to giggle, he just wanted to hear more about Buck and Thornton. As Abigail read the story, and Ellen turned the pages of the comic book, Wire heard about the sad death of Thornton, and the revenge Buck took on the men who had hurt him. There was a girl wolf that Buck liked, though, so he wasn’t left alone. In fact, they started their own wolf pack, with Buck as their leader. “Now, how did you like the story about Buck?” Abigail asked Wire. Wire’s tail wagged, and he rolled over and over several times, then went to Abigail and rubbed against her hand holding the wonderful book. “That’s what I thought,” Abigail said. “I knew you would love the story of Buck. It was a cruel time, and dogs were needed to pull sleds on snow and ice, in cold weather. There were many bad people then, and they didn’t treat animals with love. We should never mistreat our pets, for they are part of our family. In the end, Buck started his own family, leaving men behind. “It was the call of the wild that he answered, and he had finally found peace in a wild frontier, where only the strong survive. “Aren’t you glad that Jack London wrote this story?” Ellen asked Wire, and he jumped and barked, and wagged his tail that much harder. 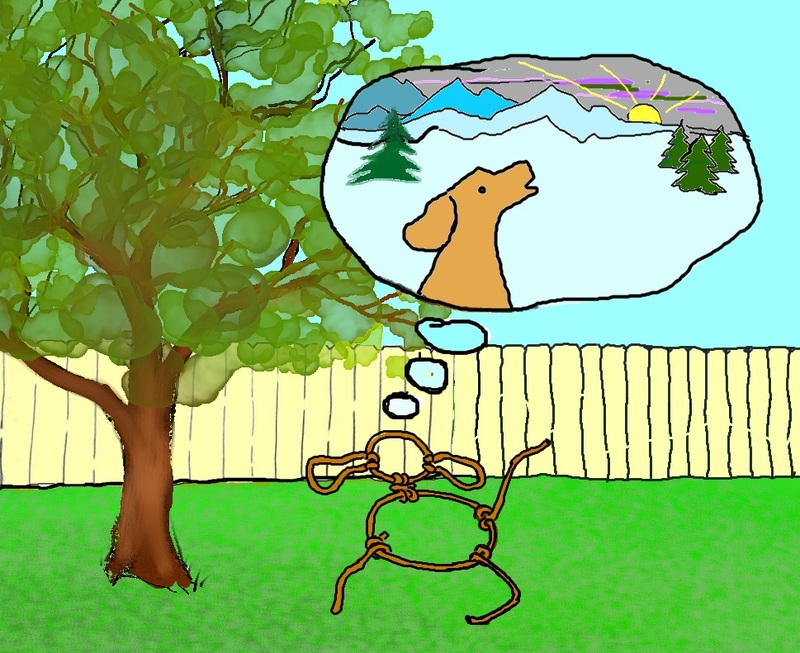 Wire would have many dreams of Alaska and the Yukon, and of a dog named Buck, and in those dreams, Wire would be running along side the big dog, their tails wagging. Tom Johnson’s dad was a cowboy and cook, and this gave his family an itinerant lifestyle. He changed schools often, as his dad’s jobs were moved. His dad wanted him to follow in his footsteps, but a cowboy’s life didn’t appeal to him. Instead, during his high school years, Tom dreamed about becoming an entomologist. He loved biology and math, but was weak in other subjects. He read every book he could find on insects, reptiles, and arachnids, as well as paleontology. However, his life changed when he joined the Army and spent a 20-year career in law enforcement. Afterwards, he and his wife started the publishing imprint, FADING SHADOWS, and published a hobby magazine for 22 years, and several genre titles for nine years. He was a voracious reader from an early age, and has never stopped reading for pleasure. In his own books readers will often find something about his love, zoology, whether insects, reptiles, or saber-tooth cats. If readers would like to learn more about the subject of paleontology, his YA novel, THREE GO BACK, features three teenage girls who accidentally go back in time through the prehistoric epochs of our past, and come away with knowledge and adventure they’ll never forget.